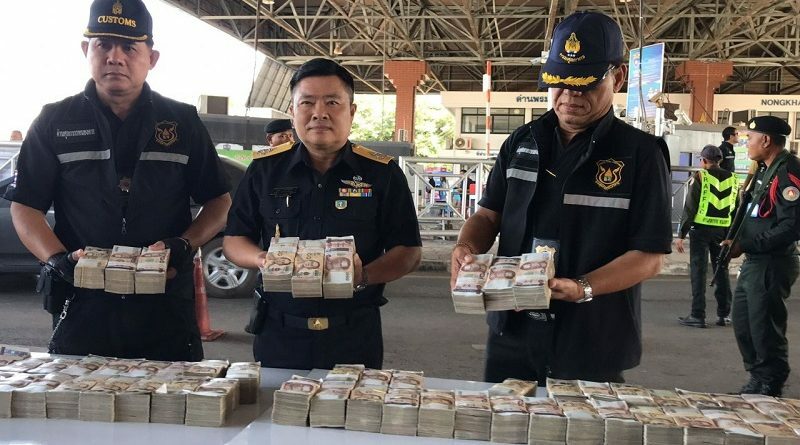 It is the third time that Nong Khai customs officials have confiscated large amounts of undeclared cash from suspects trying to cross to Laos, so authorities will make enquiries to see if they are linked and perhaps part of a larger criminal undertaking, Kritsada Thongthammachat, chief of the Region 2 Customs Office, said on Thursday. The first interception was of Bt98 million cash from two Lao men last December and the second haul was Bt30 million cash from a Thai man in June this year. Kritsada said his office would work with related agencies to determine if the cash was linked to any illegal business such as drug-trafficking. Following the arrest at 8.30pm on Wednesday at the First Thai-Lao Friendship Bridge border checkpoint, the three suspects – whose names have been withheld to prevent any hindrance to the ongoing efforts to unearth more accomplices – have admitted hiding the cash in order to smuggle it out of the country, he said. The three suspects, who all claimed to have a legitimate food business and a money-exchange service company in Vientiane, all attempted to be punished on the spot in order to stop the matter going any further, he said. They offered to each pay a Bt20,000 fine, after which they would each get back just Bt2 million, meaning the other Bt32 million – and their sedan – would be confiscated by the state. Their arrests stemmed from the customs policy of monitoring and searching suspicious private vehicles known to be regularly crossing the border. Nong Khai Customs chief Nimit Saeng-ampai said officials had been watching five groups of people allegedly linked to cash-smuggling, two of which remained free.